Motorcycle events, Rallies, Ride-outs, Motorcycle Shows, Swap Meets, Rock nights, Charity runs, Toy Runs, Bike Meets, Biker Parties, Bike Rallys and more... Please check before you pack your tent! For facebook and twitter links - if it is in green click it! Only events with 2018 include are confirmed. The Dirt Bike Show is the premier indoor off-road event on the calendar and will welcome thousands of riders and enthusiasts looking to stock up on kit and accessories across its four-day running at Warwickshire’s NAEC Stoneleigh at Stoneleigh Park. All of the major manufacturers will be showcasing their latest ranges too, and it will include 2018 models for motocross, trials and enduro. All the fans’ favourites remain in place including live action display, stunts, competitions, rider interviews and more, and there will be new elements to help Europe’s largest event of its kind grow even bigger and better. Live bands, usual fun and games, chalets and campervans parking available. price: Pre-book: £15, by October 30th. OTG: £15. Back for the annual Rockers Revival - If you love rock 'n' roll music and classic motorcycles then the Rockers Revival is just the thing to rock away that autumnal blues. The line up features Graham Fenton (1980's chart topper and Hit maker of Rockabilly Rebel with Matchbox), Crazy Cavan & The Rhythm Rockers (Wales), Lou Cifer & The Hellions (German Rockers exclusive show) and Johnny Fox & The Hunters. Merchandise stalls, hot food (burger van), raffle, large dancefloor and quality sound system. The venue has a large car park and welcome bikes from any era. A non stop rock 'n' roll event that you don't want to miss! venue: Harrow Leisure Centre, Christchurch Avenue, Harrow, London, HA3 5BD. Open 4pm - midnight. price: Pre-book: £20. OTG: £25. Under 16's free. All Day Ton Up Day – England Expects! The idea was to create the biggest poppy ever attempted on Remembrance Sunday, in respect of our Armed Forces, past and present. 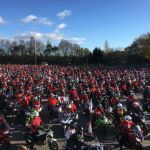 Thousands of bikers met at service stations and designated nine meeting points at junctions around the M25 and by 12.30 hours on Sunday 10th November 2013, the bikers, all wearing something Red, rode onto the M25 Clockwise at 55mph. Section by section the riders met up and completed the circle, which if seen from the air would show the massive Ring of Red, symbolising the Poppy. The ride is now an annual ride, with two rides, one on the M25 and another on the M60 Manchester. 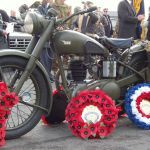 Ride out, encircling the M60 motorway on Remembrance day with bikes/trikes and all riders wearing something Red to form a virtual Poppy, when seen from above, as a Ride of Respect for Veterans of all conflicts and to raise money for veterans charities. Last year there was 1,600 participants so this year, which is the hundreth anniversary of World War 1 they are aiming to have over 2,000. Food and sundries available at the cafes and shops in the services. venue: M62 motorway, Birch Services westbound, assemble from 10:30 departing at 13:00 hours clockwise around the M60, ending back at Birch Services eastbound. Where: between junctions J18-19 M62. County: Greater Manchester. Postcode: OL10 2HQ. Spanning 11 halls, the show features 1,500 classic cars, 300 classic motorbikes and much more. Looking for classic bikers to line the route for this special commemorative remembrance parade in Ayrshire. The Malvern Classic Bike Show always gets a decent amount of trade and autojumble to fill the Wye Halls and much of the outside. Attracting a good range of bike makes such as BSA, Norton, Velocette to display which fill the centre of Hall 3 and 4. There will be catering units and a cafe providing hot food and drinks and also a concours competition taking place throughout the day with expert commentary. There will be displays from bike clubs, both local and from other regions. In addition to the 40+ Club machines on display, a number of private individuals will be attending the show to display their cherished classic bikes and be judged in their categories. There will be categories for Pre-1950's, 1950's, 1960's, 1970's, 1980's and 1990's vehicles, plus Racing & Off-Road bikes. venue: The Three Counties Showground, Malvern, Worcs, WR13 6NW. Open 10am - 3pm.